There are two depots serving the District Line, and these provide the majority of the trains for passenger service each day. The two depots are at Upminster at the east end of the line and Ealing Common at the west end. Each of these handles D78 Stock trains - I'll cover the supply and provision of the C stock trains later. Each depot fulfils similar functions. They provide the daily cleaning and technical checks of the trains to ensure their fitness for service each day. They also handle the inevitable failures which occur with the trains which have resulted in a train being taken out of service and in need of unscheduled repair or maintenance. Each also has overhaul facilities too where the periodic in depth servicing and maintenance is carried out. I will give a little historical background and a brief geographical description each of the two depots however. Ealing Common depot was opened in 1904 at the time of the electrification of the District Line. It is sited between Ealing Common and Acton Town stations and a good view of it is available if you travel eastbound between these two stations. Much of the depot remains unchanged and the shed buildings still have much of the character of their original construction. Each of the shed roads can take two D78 Stock trains. However some of the roads are not routinely used for the stabling of trains, some are devoted entirely to the workshops and overhaul staff. One is used as a 'deep cleansing' facility where the trains are periodically thoroughly cleaned, both internally and externally. Exit from the depot is routinely carried out from both the east and west ends. Entry is however made from the west end, except in times of an emergency when it is possible to stable from the east end. The East End exit from Ealing Common depot, viewed from inside the Depot and looking towards Ealing Common Station. The depot itself is quite compact geographically. From both the east and west outlets the distances to the stabling sheds and outsides is very short. Some photos in and around the depot have been added here. Upminster depot was opened in 1958 and replaced the old Little Ilford depot (which was between East Ham and Barking and now forms the site of the c2c depot). The purpose of the depot is little different from Ealing Common although geographically it could not be more different! It occupies a large site to the east of Upminster station and is accessed via quite long reception roads - one of which has a 'drive through' train wash which is routinely used when trains are leaving the depot to enter service. Upminster Depot Sheds. The two roads to the right of the picture are the heavy maintenance sheds, which contains the lifting equipment required for major maintenance. Train movements within the depot are controlled from a control tower. Instructions are passed from the tower to drivers by radio and a major difference is that all the pointwork in the depot is remotely operated, unlike Ealing Common where all points are operated by hand and so must be set manually. Further photos from in and around Upminster Depot have been added here. In addition to the two depots, the line has three other stabling points - Parsons Green, Triangle Sidings, which is between Earls Court and High Street Kensington and Barking. 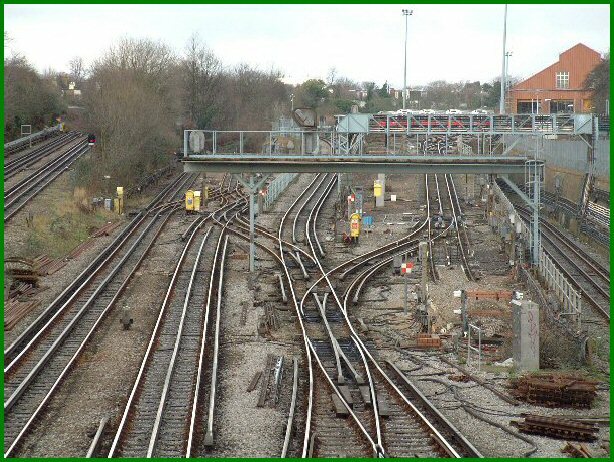 The latter sidings were constructed at the same time as Upminster depot was built. Triangle Sidings can only be used to stable C Stock trains - the D Stock is about 50 ft. longer than a C Stock and will not fit. Parsons Green has a mixture of C and D Stock trains stabled each night. Barking only has one D Stock train stabled overnight, but several C Stocks for the Hammersmith and City Line. At each of these stabling points cleaning teams and Train Technicians attend the trains over night for servicing purposes. The maintenance point for the C Stock trains is at Hammersmith depot, adjacent to the Hammersmith & City line station at Hammersmith. The train service is intended for the trains used by the District Line to be rotated into this depot for routine inspections and maintenance. Although the District Line nominally owns the C77 trains, in fact they are all part of a pool and thus can be used on any of the routes on which C Stocks are employed.